COTG 30th Anniversary: Early Champions of the Galaxy Newsletters Uncovered! The earliest COTG newsletters have recently been found! These four newsletters, which predate the beloved Club Galactica Super Report, were created and sent out by Tom Filsinger himself (the final document in conjunction with promoter Mark Ashby). Prior to Club Galactica, Tom distributed these newsletters periodically to promoters who wrote him with match results, federation happenings, and other GWF news! Some promoters contacted each other with the address information listed, forming the network that was a precursor to Club Galactica. Click here to download the zip file with PDF versions of these 4 newsletters! 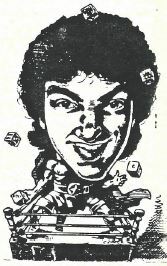 March 1987 – Champions of the Galaxy has been out for less than one year, but Tom is already hypothesizing about the future of the game, including new characters, color cards, and a game box! Tom published rankings based on promoter results and the promoter-made special match rules for a battle royal and first-blood cage matches are shared in the letter column. The latter rules ended up very popular amongst promoters, with some feds even recognizing titles for these stipulations. May 1987 – The “Galaxian Supercard Special Edition” newsletter is published, with supercard results from eight different promoters. Updated rankings are also compiled. December 1987 – The “COTG Special Newsletter” announces the impending arrival of Galaxian Invasion ’88, the first expansion for Champions of the Galaxy. While the prior newsletters had been sent to those corresponding to Tom, this newsletter went to all promoters who had ordered the original COTG edition. This newsletter revitalized many promoters’ interest in the game and created many lifelong COTG players. Included in the document were rankings, match results, and promoter letters, which included fan-submitted rules for a Galactic Chain Match and Barb Wire Cage Match. The first glimpse of an Invasion ’88 character, Bishop Hell, graced the front cover, while the back cover listed the names of nine of the twelve wrestlers included in the new edition. (A tenth character, Dark Star Creature, was listed as Vanity’s tag team partner, but as longtime promoters know, his name was changed to the Creeper at the last minute.) Never have four short pages contained so much excitement! June 1988 – Eight full size pages hit the galaxy announcing the formation of Club Galactica, the legendary fan club coordinated by Mark Ashby! An original Chuck Carter cover of Star Warrior battling Bishop Hell graces the cover. Highlights included a Carter interview conducted by Tom Filsinger, supercard results, promoter mailbag and the first rankings including the Galaxian Invasion wresters. Details on how to join Club Galactica are provided to promoters, along with information on the GWF Sales Force. The newsletter wraps up with another promoter’s take on battle royal rules and revised Galactic Chain Match rules by original creator Frank Audibert. This article submitted by Chad Olson. Thanks Chad! ← RPG Vice Looks to Shake Up ROH Tag Division!